Tilapia ranks as the second most cultivated fish in the world, after carp. Tilapia is one of the most popular farmed fish in the world and its production is increasing. Tilapia is considered sustainable for raising thanks to its herbivore eating habits, feeding mainly on plankton, filamentous algae, aquatic macrophytes and other vegetable matter. As a result, tilapia does not accumulate pollutants and other toxins in their bodies. It has become the mainstay of many small-scale aquaculture projects of poor fish farmers in the developing world. According to Dr. Rafael D. Guerrero III, the executive director of the Laguna-based Philippine Council for Aquatic and Marine Research and Development (PCAMRD), tilapia is now cultured in more than 70 countries. 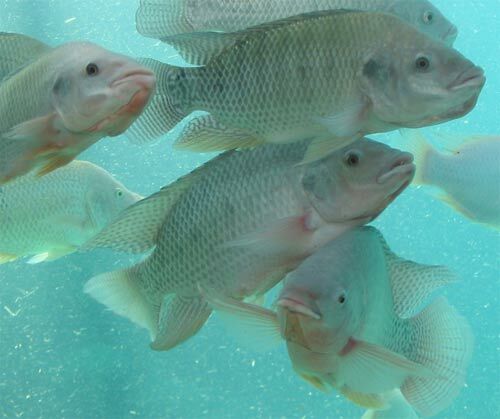 Fishery experts have dubbed tilapia as “aquatic chicken” because it possesses many positive attributes that suit the fish for a varied range of aquaculture systems. For one, tilapia tolerates a wide range of environmental conditions and is highly resistant to diseases and parasitic infections. Other good traits of tilapia include excellent growth rates on a low-protein diet, ready breeding in captivity and ease of handling; and, more importantly, wide acceptance as food fish. Currently, there are an estimated 15,000 hectares of freshwater ponds and 500 hectares of cages in lakes in lakes and reservoirs producing over 50,000 metric tons of tilapia. Tilapia was first introduced into the country in the 1950s. Today, there are four species raised in the country: Oreochronlis niloticus, O. mossambicus, O. aureus, and Tilapia zillii. The Philippines now ranks fourth among the top ten largest tilapia producers in the world – after China, Egypt and Thailand. Other top producing countries, according to the UN Food and Agriculture Organization (FAO), are Indonesia, Uganda Mexico, Tanzania, Kenya, and Sri Lanka. Tilapia production grew by 5 percent during the last 14 years, noted the industry strategic plan for tilapia. This served as a major determinant in the gross supply of tilapia in the country. Tilapia surplus stood around 2,000 to 5,000 metric tons during the same period. At 2020, the surplus is expected to reach around 10,000 metric tons. Tilapia products – fresh and frozen fillets, whole and gutted fish – have become important commodities in the international seafood trade. However, the Philippines cannot supply the international market with frozen whole fish since our price is much higher than those coming from Thailand and Taiwan. Select a site where water is accessible throughout the year. It should be well exposed to sunlight, which hastens the growth and multiplication of small aquatic plants called algae (”lumot”), which serve as food for the tilapia. More important, it should not be flooded during rainy season. The size of the pond should be determined by the number of fish you want to raise. A good guide is 2-3 mature fish per square meter of water surface. The depth of the pond should be one meter with water not less than three-fourths meter deep. Manage the water so that it will not flow continuously through the pond. To insure that no fish will escape, fine-meshed bamboo or fence should screen ponds that have waterways connecting them to canals or outside water. Both the inside and outside end of each waterway should be screened. Use big bamboos for inlets and outlets for small ponds. Since the pond is newly constructed, you have to apply fertilizer. Do this one week before stocking. Apply chicken manure on the pond bottom with water depth of about 6 centimeters at the rate of one kilo for every lo square meters. Fertilize the pond once a month to insure good production of algae. You can either use commercial fertilizer or organic matter like manure, compost, ipil-ipil leaves, etc. If you do not have organic matter, apply every month one-half kilo of urea and one half kilo of 15-15-15 for even, 100 square meters of water surface. Obtain your first supply of young tilapia from any reliable fishpond owner. One source of tilapia fingerlings is the Mindanao Baptist Rural Life Center (MBRLC) Foundation, Inc, in Kinuskusan, Bansalan, Davao del Sur. If fingerlings are unavailable, you need about 20-30 pairs of good breeders to start reproducing in your tilapia pond of 10 x 20 feet. If fingerlings are available, you will need to plan on about 5 to 6 fingerlings per square meter of water surface area. The most common breeds of tilapia available are: Nilotica, Mozambique, and GIF (genetically modified). Before stocking the pond with tilapia, be sure to drain it thoroughly and remove the weeds and unwanted fish that may be present. Allow your pond to dry up until it cracks before refilling with fresh, clean water. Fertilize the pond one week before stocking. Stock the pond either early in the morning or late in the afternoon when the water temperature is low in order to avoid weakening of the fish. Allow the water in the pond to mix gradually with the water in the fish container before putting the fish into the pond. – Feed daily during morning and afternoon at one portion of the pond. Supplement feeds with fine rice bran, bread crumbs, earthworms, termites, and others at an initial rate of 5% of the total body weight of the fish. – Maintain the natural fishfood by adding more fertilizer. Place chicken droppings in sacks and suspend in the water at every corner of the pond. Put 2.5 kg of chicken manure per bag. – Plant “kangkong” and “gabi” at one portion to provide shade for the fish during hot weather and to serve as growing media for natural fish food. Water lily also provides shade. However, do not totally cover the pond with plants as this will interfere with the natural food production process. – Prevent seepages and leakages by patching them with muds. Clear the pond dikes of weeds. – Check the gates occasionally to prevent entry of other fish species and avoid loss of stock. If your home lot is easily flooded, place stones around the top of dikes to prevent the escape of fish if the water overflows. – Find ways to keep the mudfish (”haluan”) out of your tilapia pond. The mudfish is a ferocious predator of tilapia fingerlings and ever larger fish. – Plant more trees within the sources of water to maintain the flow. Protect the riverbeds from toxic waste water and pesticides and avoid dumping of garbage. – Plant trees and grasses near the dike to avoid erosion. You can harvest tilapia by using a dip net or a lift net. Lower the net down to the bottom of the pond and spread a small amount of feed on the water just above the net. Lift the net as fast as possible to prevent the escape of the tilapia. After harvesting, stock the pond again. Research at the MBRLC shows that you can make your fishpond more productive and profitable by raising a pig at the site of the pond. Pig wastes go directly to the pond and help to fertilize the tiny plants that serve as the tilapia’s main food. Tests have proven that tilapia cultured in this kind of pond can be eaten without any harmful effect. Many farmers in Mindanao have already adopted this technology in their own fishponds. Tilapia is a good quality food and has a firm and delicious flesh. Unlike milkfish (”bangus”), it has few fine bones. Tilapia is suitable also for processing into dried, salted dried, smoked or pickled products. It is a good insect and worm predator and is known to help clean many injurious insects from ponds. To a certain extent, tilapia can help in keeping down the number of mosquito larvae, thus preventing them from developing into troublesome and harmful mosquitoes. Rinse the tilapia fillets in cold water and drain thoroughly. Marinate the tilapia in a shallow pan with the beer and shallots in a shallow pan. Top with butter or margarine and lemon juice. Broil about 4 inches from the source of heat for approximately 5 to 6 minutes or until the fish is opaque and flakes easily when tested with a fork. Top each portion with 1-2 tablespoons of Lemon-Parmesan Sauce; broil 2-3 minutes or until sauce puffs and turns golden brown. Place fillets on serving plate; garnish with lemon slices and fresh parsley. Agri-Aqua Network International (AANI) Inc.
Do you like this Money Making Business Idea? then please consider subscribing to our RSS feed. You can also subscribe by email and have new articles sent directly to your inbox. (Once you entered your e-mail address, you need to login to your e-mail account and click the link to confirm your subscription). this is nice article for readers. if you fed tilapia with pig manure, don’t you think your tilapia would smell awesome? Do you think people will buy if they knew that? I want to start a tilapia bussiness, but i dont know how??? Woow Thanks you very much by sharing a sweet information. Feeling awesome. I dream this aquaculture business…. this has been very informative and useful tnx. hi gud day, pls show me on how to raise tilapya in drum? Hi, thanks for this comprehensive and useful info. Maybe I’ll be a tilapia fish-farmer one day!